Astronomers using the Atacama Large Millimeter/submillimeter Array (ALMA) in Chile have discovered that planets orbiting the star Fomalhaut must be much smaller than originally thought. 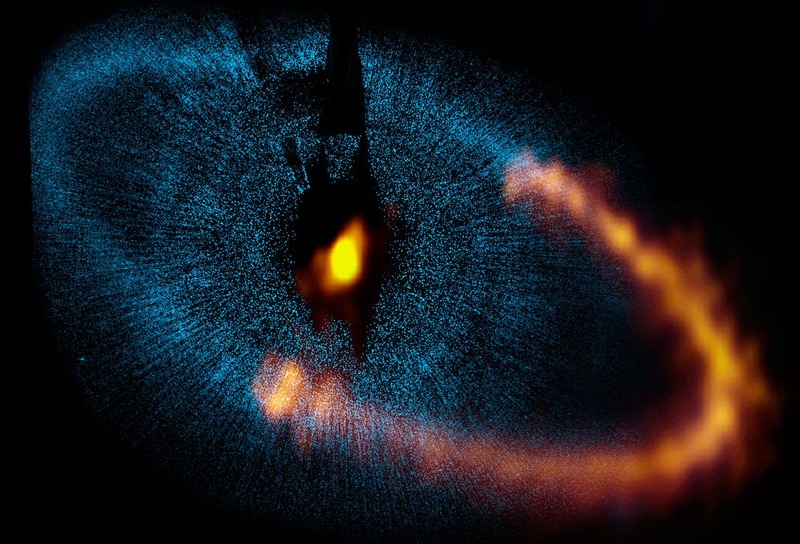 The discovery was made possible by exceptionally sharp ALMA images of a disc, or ring, of dust orbiting Fomalhaut, which lies about 25 light-years from Earth. It helps resolve a controversy among earlier observers of the system. The ALMA images show that both the inner and outer edges of the thin, dusty disc have very sharp edges. That fact, combined with computer simulations, led the scientists to conclude that the dust particles in the disc are kept within the disc by the gravitational effect of two planets — one closer to the star than the disc and one more distant. Their calculations also indicated the probable size of the planets — larger than Mars but no larger than a few times the size of the Earth. This is much smaller than astronomers had previously thought. In 2008, a NASA/ESA Hubble Space Telescope image had revealed the inner planet, then thought to be larger than Saturn, the second largest planet in our Solar System. However, later observations with infrared telescopes failed to detect the planet. "Combining ALMA observations of the ring's shape with computer models, we can place very tight limits on the mass and orbit of any planet near the ring," said Aaron Boley (a Sagan Fellow at the University of Florida, USA) who was leader of the study. "The masses of these planets must be small; otherwise the planets would destroy the ring," he added. The small sizes of the planets explain why the earlier infrared observations failed to detect them, the scientists said. The ALMA research shows that the ring's width is about 16 times the distance from the Sun to the Earth, and is only one-seventh as thick as it is wide. "The ring is even more narrow and thinner than previously thought," said Matthew Payne, also of the University of Florida. The ring is about 140 times the Sun-Earth distance from the star. In our own Solar System, Pluto is about 40 times more distant from the Sun than the Earth. "Because of the small size of the planets near this ring and their large distance from their host star, they are among the coldest planets yet found orbiting a normal star," added Aaron Boley.